Plug it into the cigarette lighter socket, turn your car FM radio on, find an empty radio station(87.5-108.0 MHz), and match it to the transmitter. Then you can pair it with your phone for music. It will power off after you long pressing the auto-scan button for about 3 seconds. Adopted advanced interference and noise cancellation technology - CVC technology creates full duplex sound and suppresses noise and wind. 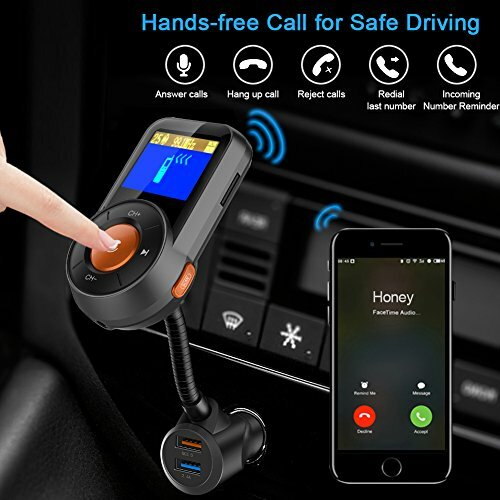 Take hands-free calls for pleasurable driving experience! 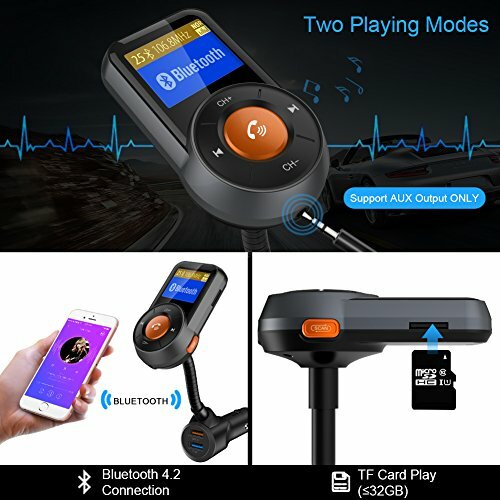 Long pressing the multifunction button for about 3 seconds to change the Bluetooth and TF card mode. 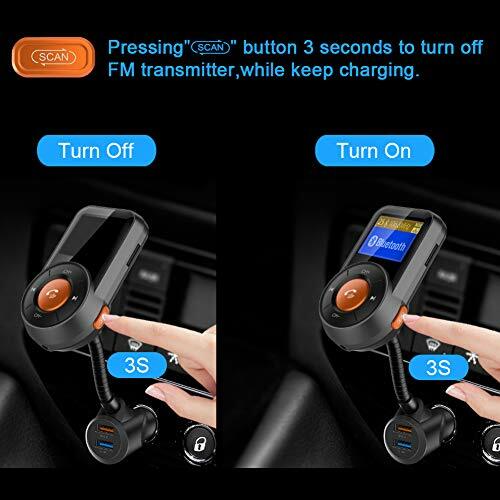 ✅ Power on/off button - Long press the "SCAN" Button for 3 seconds to power off/on FM transmitter, but still can keep charging. 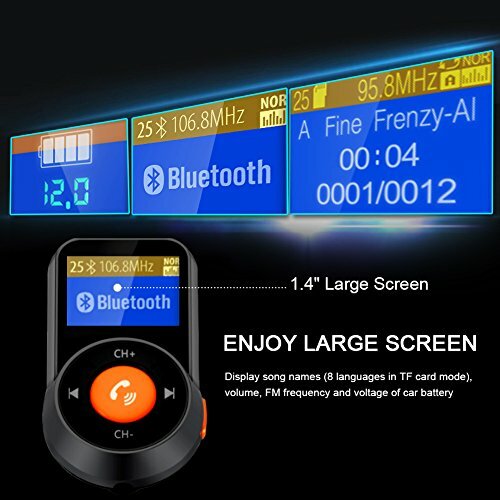 ✅ Large Display Screen - Double color 1.4 inches screen can display voltage level in car battery, volume, FM frequency and song name if you play music from Micro SD card. Super bright to read at night and in the day. (songs via Bluetooth will not display). 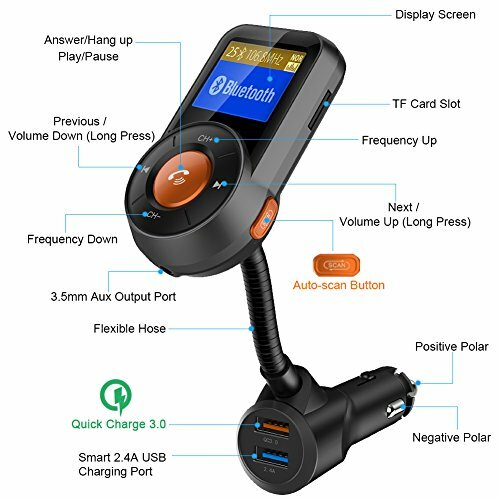 ✅ Crystal Stereo Sound - Bluetooth Car Adapter built-in microphone with Echo cancellation and noise suppression (CVC) technology that creates full duplex sound and suppresses noise and wind, offer your hands-free talking and wonderful music. 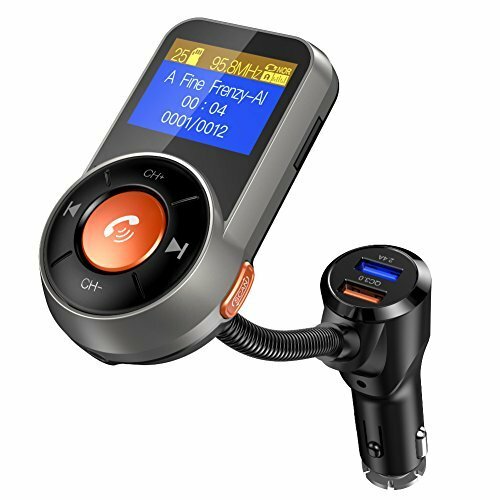 ✅ Universal Compatibility - Car FM Transmitter can not only play music from Bluetooth enabled devices, such as iPhone 8,iPhone 8 Plus, iPhone X, iPhone 7, iPhone 7 Plus, Samsung, Tablet,iPad and Smartphones etc, but also can play music from TF card in MP3/WMA/WAV/APE/FLAC format. 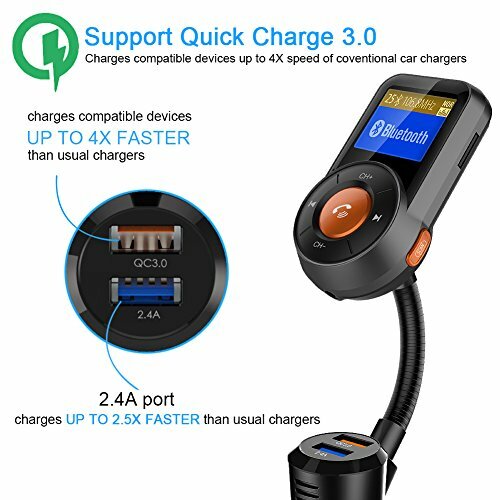 Moreover, you can use the included 3.5mm audio cable to transmit music through Bluetooth if your car has aux-in port. If you have any questions about this product by SRUIK, contact us by completing and submitting the form below. If you are looking for a specif part number, please include it with your message.